Raising Films was established by five UK-based film sector workers who recognised, from the start, that film and television are international industries. We are delighted to welcome international chapters of Raising Films, to share and compare information, and to make change together! In early 2017, producer Leonie Mansfield and scriptwriter Nicole Dade reached out to Hope Dickson Leach, one of the original founders of Raising Films here in the UK, about our work and the need to address similar issues in Australia’s industry. Hope then connected with local practitioners (including current WIFT NSW president Megan Riakos and secretary Lucy Fisher and founding team members Kate Separovich, Kristen Hodges and Shideh Faramand) through a Raising Films brunch held at the 2017 Sydney Film Festival. From that, as women do, things got done and Raising Films Australia was officially launched in February 2018! Today the strategy is being driven by the current WIFT NSW team with some strategic additions. 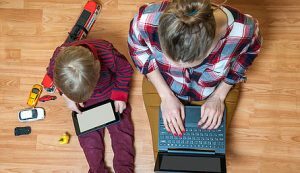 Raising Films Australia will also investigate other possible initiatives such as the creation of a portable crèche bus/on-set creche and a benevolent fund for financial assistance to parents and carers. Follow Raising Films Australia on Facebook and sign up to the Raising Films Australia mailing list. Or send the team an email. 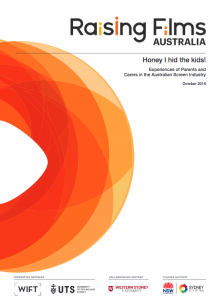 The Raising Films Australia Screen Industry Survey report – Honey, I Hid the Kids: Experiences of Parents and Carers in the Australian Screen Industry was launched at The Adelaide Film Festival in late 2018. Download the report via the image above. Raising Films Australia’s latest initiative is the Making It Possible Pilot. The pilot is a free one day course with follow-up mentorship, to be held in city and regional locations across New South Wales, in Sydney, Penrith, Byron Bay, Dubbo and Bega. Click on the image above for further information.